All types of electronics removed. T.V's big or small, stereo's, dvd, vcr, computers, monitors, electric motors, wiring, circuit boards, etc. All items are properly recycled. 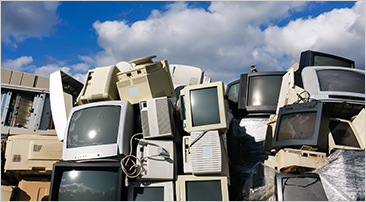 BEE JUNK FREE offers E-Waste Removal and other Junk Removal Services to clients across Peterborough, Lindsay, Port Hope, Cobourg, Bowmanville, Courtice, New Castle, Kawartha Lakes, Campbellford, Whitby and Oshawa, ON.